DROID X Actually has Snapdragon Processor? What? Snadragon processor? Since when? The new @DroidLanding Twitter account is already causing quite a stir. 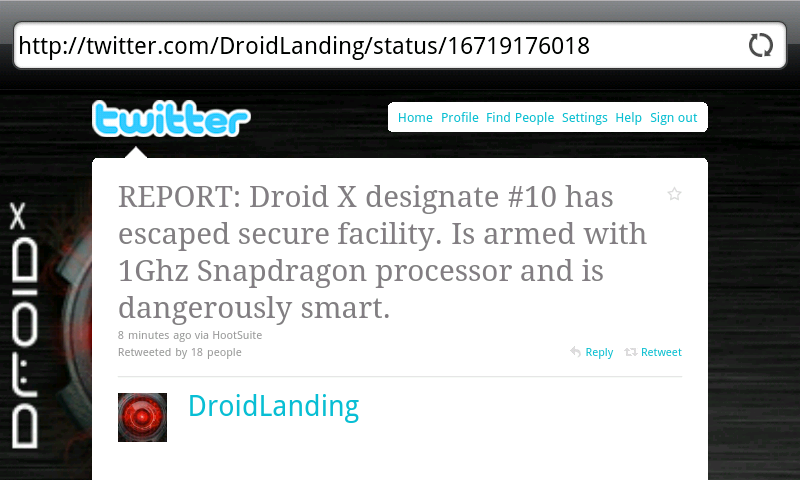 In its first meaningful tweet, a “1Ghz Snapdragon processor” is mentioned for the Droid X and has us all completely confused and disappointed. Really? The benchmark numbers we’ve seen blow away anything on a Snapdragon other than the Nexus One running Froyo leading us to believe this is all one big joke. Every other report we’ve seen has mentioned a Texas Instruments OMAP processor…we’re needing answers here people. Stat. If this is another blunder similar to the 720p screen slip-up, then someone else needs to take over the Droid X campagin. Update: Looks like another Verizon blunder. That tweet has now been removed. Can we take the interns off of the social campaign for the biggest device launch of the summer already? Are we ready to call this Twitter account a fantastic hoax yet?